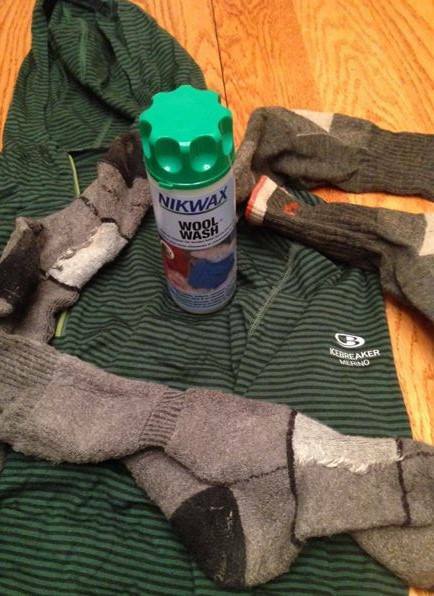 Take care of washing expensive hiking clothing by using products meant for the job, like Nikwax Wool Wash.
I’m Just back from a big trip with my friends up in New York’s Pharaoh Lakes Wilderness, so now it’s time to unpack my camping and backpacking gear and start washing everything. I have invested a lot in high performance synthetic and wool clothing, and when washing expensive hiking clothing, I am really careful to keep its functionality. This gear must be both warm and breathable, and must wick moisture away from my skin so that I stay dry and comfortable. I find that washing this type of gear with regular detergents reduces its performance. In particular, I find that after washing a nice synthetic shirt with regular detergents, the garment will start to feel clammy when I wear it.